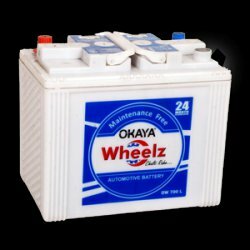 Okaya wheelz is a rechargeable and maintenance free auto battery based on Japanese technology. This battery is also known as ‘Automotive battery’ and comes with six galvanic cells. The battery has a robust grid design to manage all the vibration, and specially manufactured keeping Indian conditions in mind.